Central Kitsap’s Katie Downey and Sumer McDermed were named to the All-South Sound Conference teams on Tuesday. Downey, a senior setter, was selected to the first team while McDermed, a senior libero, was named to the second team. 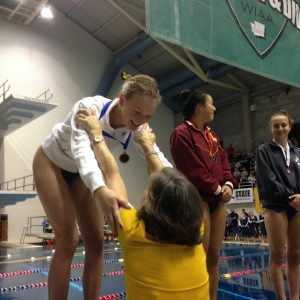 First team—Selena Dutton, Gig Harbor; Olivia Fairchild, North Thurston; Natalie Stark, Timberline; Hali Ehresmann, Capital; Lauren Hatfield, Gig Harbor; Maia Nichols, Capital; Kasey Louis, Timberline; Katie Downey, Central Kitsap. Second team—Rachel Howard, Gig Harbor; Lauren Porter, North Thurston; Tia Grow, Capital; Summer McDermed, Central Kitsap; Haley Parson, North Thurston; Lindsay Skates, Gig Harbor; Raja Togiola, Timberline; Abbey Middleton, Yelm. Honorable mention—Hannah Yerex, Gig Harbor; Jocelyn Porter, North Thurston; Taylor Benedict, Shelton; Myah Rodius, Shelton; Mackenzie Anderson, Yelm; Maddie Anderson, Peninsula.